North Beach Camp Resort is convenient to the many attraction of the city of St. Augustine: The Nation’s OLDEST City! 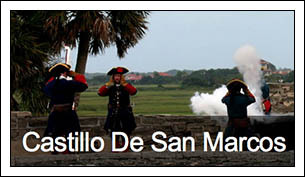 The Castillo de San Marcos National Monument is an awesome site that symbolizes the clash of cultures throughout the history of this land. Erected as a symbol of the largest empire ever created, the Castillo protected and defended Spain’s interests in the New World and its battle-scarred walls testify to over 300 years of cultural conflict. Today, the Castillo remains a vital connection to the past through a wide array of programs which include museum exhibits and demonstrations, living history reenactments, Ranger presentations and other special events. The Government House Museum is found at the west end of the St. Augustine Plaza and has been a primary administrative center for the city since the late 1500’s. The original Government House stood from about 1598 to the 1680s. After it was destroyed by British troops in 1702, it was rebuilt in 1706 and renovated in 1759. Little changed from the British possession of 1764 to the Spanish return to power in 1784. When Florid was ceded to the United States in 1821, the house become the courtroom and briefly served as Florida’s capitol and eventually became the post office until 1966. 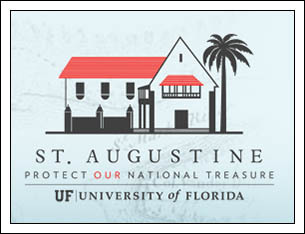 Today, teh building houses a museum and the offices of the Historic St. Augustine Preservation Board. 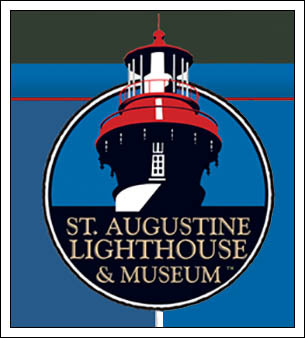 The St Augustine Lighthouse & Museum is a working nautical light station and museum that is also dedicated to preserving Northeast Florida’s vital maritime history. The St. Augustine Lighthouse, with its highly visible black and white spiral and red spire-top, is 165′ tall. Climb the 219 steps to the observation deck and enjoy a breathtaking view of St. Augustine and the Atlantic Ocean. Explore the Victorian-era house and view artifacts in the maritime museum at the site of Florida’s first lighthouse. The Oldest House Museum Complex is a major stop on St. Augustine tours. the featured attraction of the complex is the Gonzalez-Alvarez House, the oldest surviving Spanish Colonial dwelling in Florida. Occupied since the 1600s and featuring a dwelling that dates to the early 1700s, visitors see marks that Spanish, British and Americans have left behind. The Lightner Museum features cut glass, Victorian art glass, costumes, furnishings and mechanical musical instruments from the Gilded Age. Get a glimpse into 19th century daily life as you explore the beauty and history of these artifacts. The museum store offers a variety of books, jewelry, ornaments, note cards, reproduction antiques, children’s games and gifts. The museum is house in the former Hotel Alcazar, an opulent building built in 1887 in the Spanish Renaissance style when railroad magnate, Henry M. Flagler, commissioned architects, Carrere and Hastings. 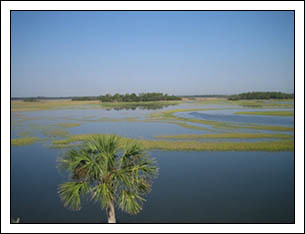 The Guana – Tolomato – Matanzas National Estuarine Research Reserve is 5 miles north of North Beach Camp Resort on A1A. It is comprised of approximately 60,000 acres of salt marsh and mangrove tidal wetlands, oyster bars, estuarine lagoons, upland habitat and offshore seas located in St. Johns and Flagler Counties. Explore abundant marine life, the northernmost extent of mangrove habitat on the east coast of the United States, and the vital calving grounds of the endangered North Atlantic Right Whale. The reserve is home to manatees, wood storks, roseate spoonbills, bald eagle and peregrine falcons. Enjoy fishing, hiking, bike trails and great auditorium showing an introductory video about the reserve, and a nature store. The Center also offers scavenger hunts for kids and adults to complete while viewing the exhibits as well as many other educational programs, events and workshops. 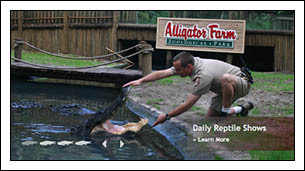 The St. Augustine Alligator Farm Zoological Park is home to rare and exotic reptiles, birds and mammals, including an enormous Australian Saltwater Crocodile, albino alligators, herons, egrets, ibis, spoonbills, wood storks, South American toucans & parrots, Australian kookburras & emus, Asian pheasants and African turacos. Marvel at seven different species of endangered monkeys, ranging from the world’s smallest, the mouse-sized pygmy marmoset, to the large South American spider monkey. 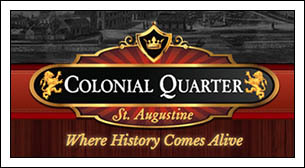 The St. Augustine Premium Outlets allow you to enjoy an impressive selection of stores and items at outstanding prices. The shops include: Banana Republic, Brooks Brothers, Calvin Klein, Carter’s Coach, The Gap, J Crew, Mikasa, Movado, Nike, OshKosh B’Gosh, Polo, Ralph Lauren, Reebok, Tommy Bahama, Tommy Hilfiger and more! ©2017-2018 — North Beach Camp Resort — All Rights Reserved.